This blog post is the first blog of a series we have about Microsoft Azure App Services. See a list of all our findings here. Re-configuring API apps added to your subscription is a task that will be a common task for everybody working with API & Logic Apps. Let us say we have an FTP connector used in our Logic Apps and the user’s password used in the FTP connector has changed. Doing that or finding the way of doing that is not the most intuitive way – you first need to select the API app itself, click on the API app host, select settings, application settings and scroll down in the blade to find the settings (see screenshot 1). 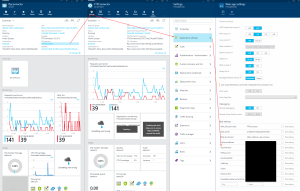 We would like a direct link to the settings in the API app/connector blade of Azure’s new portal instead of needing to open and wait for two other blades to load.